DANNY FINGEROTH is the author or editor of numerous highly-regarded books about comics. His newest book—co-edited with the legendary ROY THOMAS—is THE STAN LEE UNIVERSE, the ultimate repository of interviews with and mementos about The Man who co-created Spider-Man, the X-Men, and so many other immortal characters! Much of the material in this beautifully-designed book is rarely or never-seen material from THE STAN LEE ARCHIVES at the University of Wyoming. The STAN LEE UNIVERSE is a must-have treat for anyone interested in popular culture, comics, Marvel—and, of course, the inimitable STAN LEE. 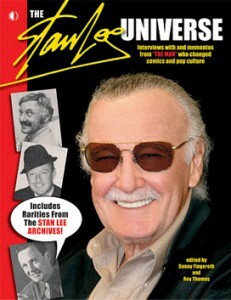 Click to learn more about and to buy THE STAN LEE UNIVERSE now! SUPERMAN ON THE COUCH has become the definitive book on why we love superheroes, written from Danny Fingeroth’s perspective of a highly accomplished superhero comics writer and editor. In this book, Danny explains why, in modern society, superhero culture has become the metaphorical prism through which we see—and live—our lives, and why superheroes have become potent myths for our times in movies, TV, and games, as well as in their birthplace, the comics. 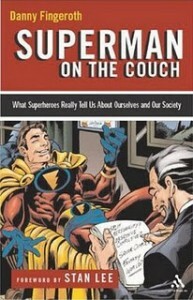 Click to learn more about and to buy SUPERMAN ON THE COUCH now! “Not only do comic book superheroes Batman and Superman disguise themselves to save the world, but, according to former Marvel group editor Fingeroth, they also disguise their Jewish heritage and values. 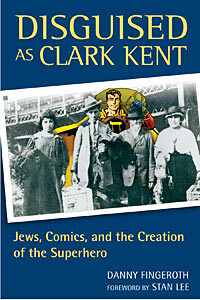 [Fingeroth] uncovers Jewish themes in comics history, starting with the introduction of Superman in 1938 and ending with a look at what the current crop of Jewish mainstream comics creators are doing with the freedom to explore overtly their religion. Chronicling the creation of each new ‘Jewish’ superhero, Fingeroth notes the concurrent changes in the comic industry, including the audience shift from children to adults and the effect of comic critic Fredric Wertham. Click to learn more about and to buy DISGUISED AS CLARK KENT now! 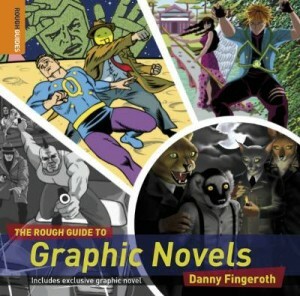 The Rough Guide to Graphic Novels is the ultimate companion to the expanding world of the “literary comic book”. Written by comic industry insider Danny Fingeroth, it includes the mediums history, from sequential art in Egyptian tombs, through the superhero boom of the 1940s to the birth of the graphic novel movement and the latest online offerings. All you need to know about the best and rest with 60 must-read graphic novels, including the genre-defining Maus and A Contract with God, plus modern classics-in-the-making Fun Home and Alice in Sunderland. The guide profiles the movements legends including Harvey Pekar, Chris Ware, Denis Kitchen and other amazing illustrators, writers and publishers who’ve helped win respect for this once marginalised art form. And everything else you need to know from “how to make a graphic novel” to Persepolis and the latest film and television offerings, manga, documentaries, conventions, books, magazines and websites. Click to learn more about and to buy THE ROUGH GUIDE TO GRAPHIC NOVELS now!